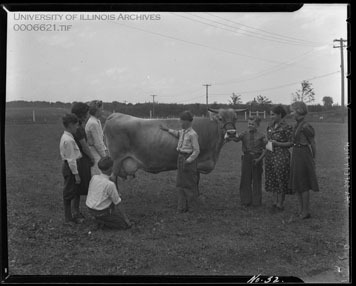 Illini Nellie began giving milk in April, 1930. Over the next ten years, she averaged a daily output of 93.5 pints of milk; total milk production during her lifetime was 194,665.8 pounds. This high level of milk production is especially noteworthy as she lived in an era before dairy nutrition was carefully defined. 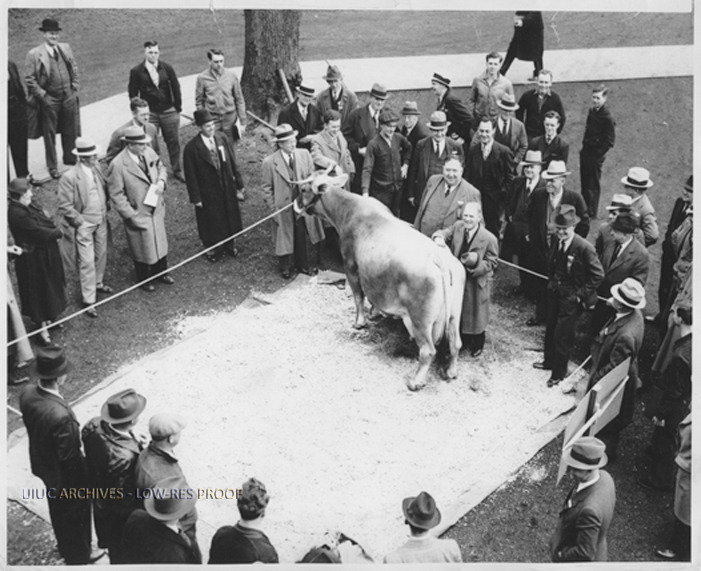 With a number of world records smashed for both milk and butterfat, Illini Nellie became the star of the University. College of Agriculture officials even trotted her out when state legislators visited the campus. For the occasion, staff stacked bottles of milk representing her average daily production, 93.5 pints of milk, and the 2.5 cartons of butter that could be made from that milk. Illini Nellie was such a world celebrity, Ève Curie called upon her during a campus visit in 1940, whereupon Nellie simply yawned and switched her tail. Illini Nellie’s impact on the University and dairy production was so long-lasting that she had a poem written in her honor by Don Carroll, former geologist with the Illinois Geological Survey. Upon her death on November 19, 1940, Illini Nellie was buried in a special grave on the lawn of the Purebred Dairy Barn. John Milton Gregory is the only other individual to be buried on campus grounds. Accorded to the world champion cow. Has vanished too, as Nellie, in the grave. Recording the records that may never fall. Beyond the reach of pitchforks, pails, and flies. Made famous as Illini Nellie’s stall. Is there another worthy of the call? As at the hooves of Nellie there was laid? Even tho another give more milk. And vibrant glamour oozed with Nellie’s sighs. The queen of queens, tho dead, is still the queen. Her lactic crown shall never lose its sheen. We loved her for her gracious, regal manner. Her coat of horns remains upon our banner. Illini Nellie with 4-H Club, June 11th 1938: Members of the Ford County 4-H Club, including James Stuckey, Rita Jean Woodword, Rosemary Kurtenbach and Mary Ellen Spelbring, visiting with Illini Nellie. Image courtesy University of Illinois Archives Found in RS 39/2/20, Box 21, AGR-3, 4-H.
Jordan, Angela, “Illini Nellie,” ExploreCU, accessed April 22, 2019, https://explorecu.org/items/show/259.